Step inside this time machine as we go back to the awesome era of VHS with in-depth discussions on the glory days of VHS, Video shops, renting videocassettes and VHS nostalgia. VHS is still relevant today and loved by so many people across the globe, VHS will never Die - Once called the "Dead Format" VHS has truly risen from the grave defining the odds and is taking no prisoners, find out why VHS still lives from VHS collectors themselves. 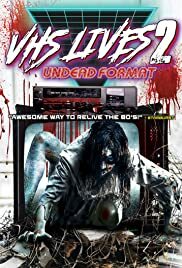 VHS Lives part 2: Undead Format is a trip down memory lane with a look back at VCR players and VHS tapes. Sit back as we rewind back through cult VHS tapes, video players and video shop nostalgia. Sit back and immerse yourself in everything VHS, from collectors talking about their VHS memories, favorite VHS tapes and distributors - to the highs and lows of the VHS era.